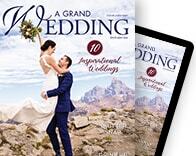 A Grand Wedding is published by Teton Media Works, Inc. Please contact us for advertising rates and specifications. Please send editorial inquiries or submissions to our Editor, Rebecca Mitchell at rebeccam@tetonmediaworks.com. Please send photographs or photography inquiries to our Art Director, Samantha Nock at snock@tetonmediaworks.com. Please send design comments and feedback to our Art Director, Samantha Nock at snock@tetonmediaworks.com. Please use our online submission form to submit your wedding story. Please send your inquiry to getintouch@tetonmediaworks.com.